From 6S, I have upgraded to iPhone 8 and I feel there’s much better performance, but the design remains almost the same. I love the camera and the gold color looks so premium to hold. Comes with wireless charging. I bought this phone just the day after its release and after using this phone for awhile, I found these pros and cons. 1. 12 MP Primary Camera with optical image stabilisation allows the user to click amazing quality pictures. 2. Wireless Charging, splash , water and dust resistant. 3. The new processor is super fast. 4. Battery life is much better than previously launched IPhones. 1. It looks exactly like IPhone 6 or 6s. So it doesn&apos;t give the user the feeling or rather flaunting the new iPhone 8. I would totally recommend the new IPhone 8. As it&apos;s pros overshadow its cons. I bought this phone just after its release. I totally recommend this phone to everyone. - 12 MP camera with optical image stabilization which allows the user to click amazing pictures. - Splash, water and dust resistant. - Looks exactly like iPhone 6 or 6s. Iphone 8 is a very stylish phone launched by apple. Apple has a bery good brand name, so it is definitely a good option. Apple iPhone 8 comes in with an exceptional build quality, with a glass based design - built to the highest standards, water-proof, and still one of the best-looking flagships, across all smartphones. Excellent class-leading IPS display, slightly improved from the iPhone 7 - adding &apos;True Tone&apos; support. 67 Pricebaba users have written their experience with Apple iPhone 8. If you own Apple iPhone 8, please do leave your feedback too. Lowest price of Apple iPhone 8 price in India starts at Rs. 58,799 Apple iPhone 8 is available on Flipkart at Rs. 58,999 and on Amazon at Rs. 58,799. Prices updated on 25th April 2019. 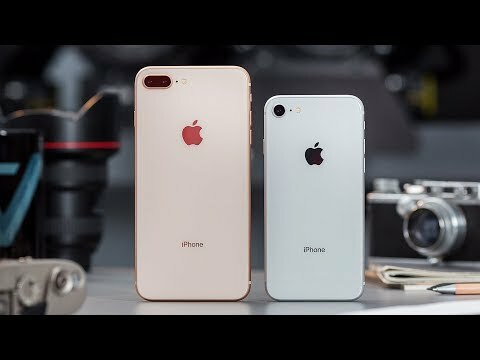 Apple released three new devices namely iPhone 8, 8 Plus and the much awaited iPhone X on it’s 10th anniversary. Fundamentally, the iPhone 8 can be said as the fourth generation of iPhone 6. Let's take a look at the detailed overview below. The front side of the iPhone 8 has a 4.7-inch retina display with screen resolution of 1334 x 750 pixels and pixel density of 326 PPI. The screen is made up of ion-strengthened glass and comes with a 3D touch feature. Unlike the previous generations the iPhone 8 features a glass panel at back instead of aluminium design. It comes in 64GB storage capacity. Apple is appreciated widely when it comes to phone cameras. The iPhone 8 features an advanced 12MP camera with larger and faster sensor and Optical image stabilisation. The front camera comes with a 7MP sensor. Other camera features are Phase detection autofocus and TrueTone Flash. The iPhone 8 also offers 4k video recording, slow-motion, timelapse shooting. The phone comes with a single sim card slot and ships with 4G LTE, WiFi, Bluetooth and NFC features and an Apple lightning connector. The iPhone 8 houses Apple’s latest and improved A11 Bionic hexa core processor. It improves battery life. The processor has an impact on everything that happens in the inside. It runs on the latest iOS11 with some minor new features. The iPhone 8 is IP67 rated water and dust resistant. It comes in space gray, gold and silver color. The iPhone 8 packs a 1821 mAh non-removable battery which is bit less than iPhone 7. But still the 8 has an improved battery life as compared to 7 which lasts for about a day without the need to be charged again. The big feature of iPhone8 is that it supports wireless and fast charging. As the previous generations, the iPhone 8 includes Touch ID fingerprint scanner for unlocking the phone. Other sensors include accelerometer, proximity sensor, barometer, gyrometer and ambient light sensors.